Welcome to the largest selection of American-made Filler Metals. Whether you're building a bridge or making roads safer, your job is to keep America moving. 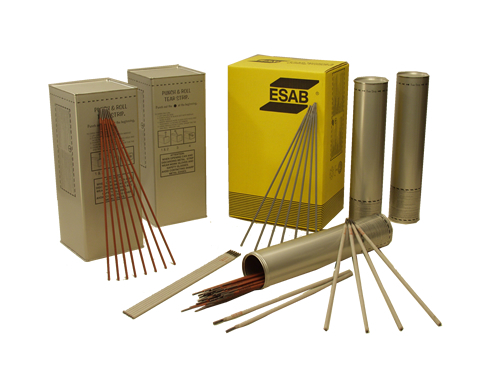 And ESAB, the worldwide leader in welding and cutting, is here to keep your projects moving with Buy America-compliant welding filler metals. We not only offer the finest crafted filler metals around, we have the widest assortment of anyone, anywhere, hands down. From Atom Arc ® to Dual Shield ® to Spoolarc ® - and much more - we're sure to have just what you need to get your job done. With ESAB, you don't have to deal with elevated costs when it comes to the Buy America program. Our premium filler metals are sold at price points that are in line with set standards - the same you'd pay for lesser products elsewhere. We give you more for less. How's that sound? Atom Arc 10018 electrodes are used primarily for applications which require weld joints of at least 100 ksi (690 MPa) tensile strength, good ductility and crack resistance. Good notch toughness at temperatures as low as -60°F (-51°C) is possible with this electrode. Atom Arc 10018-M1 is a low hydrogen, iron powder all-position electrode specially formulated to meet the more stringent requirements of Military Specification MIL-E-0022200/10 for mechanical properties, low coating moisture and diffusible hydrogen content. Atom Arc 7018 Acclaim offers softer arc and excellent mechanical properties compared to the original Atom Arc 7018. Results include greater puddle control for ease of use in out-of-position welding applications and superior arc initiation desired by many newer welders. Atom Arc 7018-1 is an all-position, low hydrogen electrode that provides exceptional impact toughness at low service temperatures. Atom Arc 7018-1 provides smooth metal transfer, minimal spatter, and easy slag removal. Atom Arc 7018-1 is used to join a wide variety of carbon and low alloy steels. Atom Arc 9018 electrodes are used for attachment welds on T-1, HY-80 and HY-90 steels and other high tensile, quenched and tempered steels. Atom Arc T was developed for welding T-1 steel in all applications. Mechanical properties of the welded joints equal or exceed the properties of the base steel in either the as welded or stress relieved condition, thus giving 100% design joint efficiency. The red coated Sureweld 10P is an all-position cellulosic electrode developed for the pipe welding industry in order to improve ductility in the weld deposit while maintaining the standard welding characteristics needed for a pipe welding electrode. Sureweld 10P Plus is a modified version of the standard 10P electrode and can be differentiated by its gray coating. It has also been developed for the pipe welding industry but has a more consistent burn-off and a more forgiving arc burn.